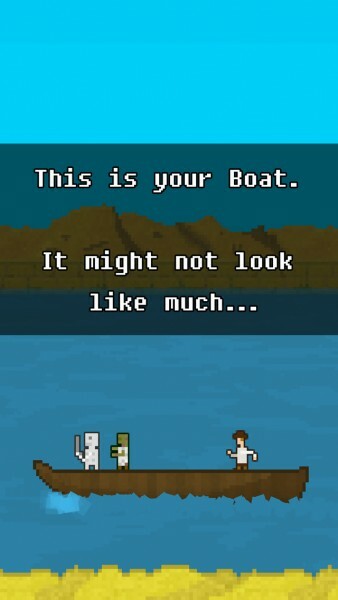 You Must Build A Boat ($2.99) by EightyEight Games LTD is the highly-anticipated followup to the original 1000000 game that came out back in 2012. 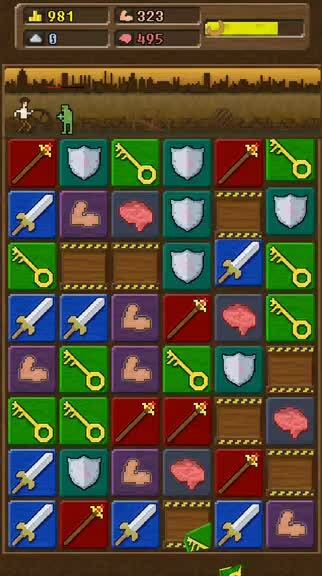 If you enjoy challenging match-three puzzle RPG games, then you are in for a treat this week with You Must Build A Boat (YMBAB). 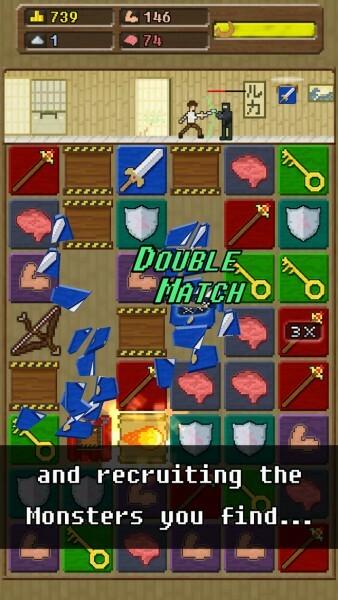 When it comes to mobile games, I’m a sucker for the match-three variety, especially when it’s mixed in with a healthy dose of RPG. 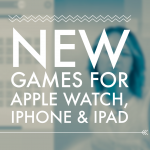 However, the App Store is filled with a ton of titles, with even more each week, so the genre itself can be tiring after a while. However, given the success and popularity of 10000000, YMBAB was a hot topic in terms of mobile gaming, so I had to check it out for myself. I believe I had 10000000, but I never got around to playing it — this is something I’ll have to fix after I’m done with YMBAB. Even if you didn’t play the original, this sequel is one of the best little games you are going to find this week if you’re a fan of the overall genre. Like 10000000, YMBAB has a rough, pixelated look that takes me back to the days of 8-bit gaming. However, I feel that the followup has more polished visuals that are certainly welcome in this day and age, and the new environments look lush and detailed. All of the animations are nice and smooth, so I had no lag on my iPhone 6. The upbeat and quirky chiptune soundtrack is a delight to the ears, and the retro sound effects are fun and charming to hear as you play. In YMBAB, players will travel the world, ranging from cool areas like the Mage Tower all the way down to the bottom of Hell. However, to do this, you’re going to need a much bigger boat than the rickety one you start out with. In order to build the boat much like Noah’s Ark, you’re going to have to find and collect resources, including new crew members who help you out on your journey. When you play a game, you choose to add “quests,” which are goals for the run. 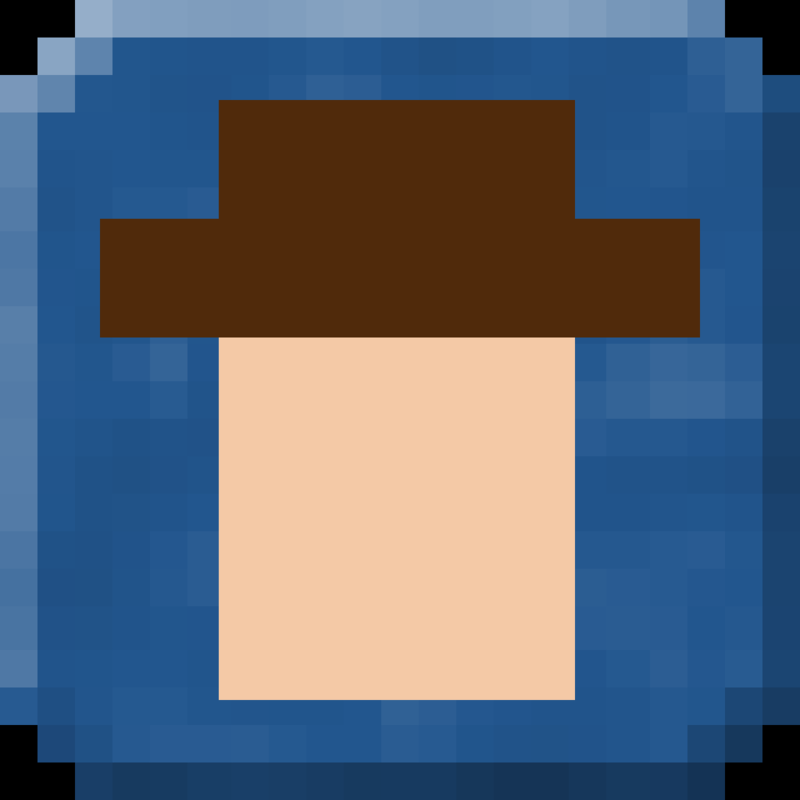 These increase the danger (difficulty) and quality (loot) of each randomly generated run, and may include special properties like mist, anti-magic, and more. The game consists of your character advancing in the area in the top portion of the screen, with the game grid taking up the rest. While each run is essentially endless, but you still have to be careful — when you get hit or are too slow, you’ll fall behind. 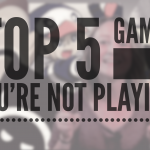 If you’re knocked off of the screen, then the run ends. You can’t lose in the game, but it will hinder your progress. If you manage to reach the next segment of the run, there will be a random roll that can increase the power of monsters, provide more chests, or give you better rewards. These rolls will always be random, so it is never the same thing. 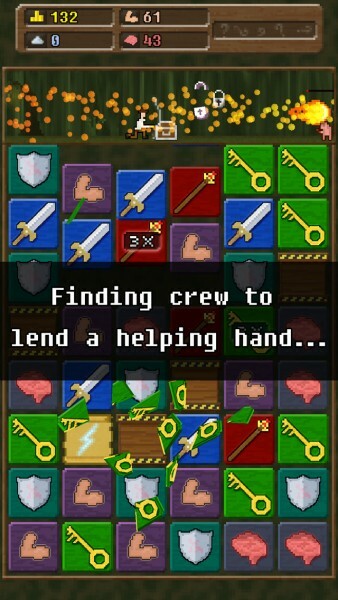 If you successfully complete a quest, you’ll be rewarded handsomely with captured monsters (and gold coin), as well as key crew members that provide you with various services on the boat. The crew can provide upgrades to your physical and magical attacks, boost your defenses, give you a breakdown of enemy weaknesses and strengths, sell extra treasures for gold, and more. They’re a key part of the game, and you need them to advance to the next area on the map. Now that I’ve gone over the core of the game, it’s time to talk about controls. While most match-three puzzles let you just swap adjacent pieces with each other or drag a piece freely around on the board, YMBAB is a bit different from the norm. Instead, the grid consists of lines of pieces, and the only way you can move them is by sliding an entire row or column to make a match. If no match can be made, then the line resets back to the original position it was in. 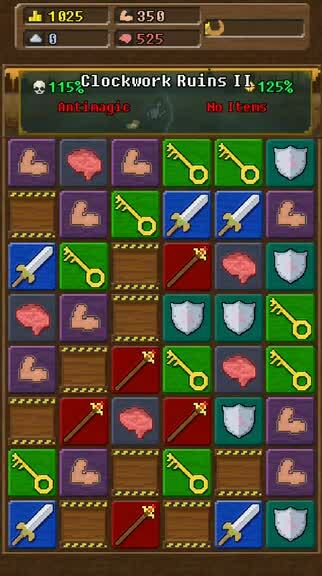 If you can get combos in or more than three blocks for a match, then you will deal more damage or get more defense. 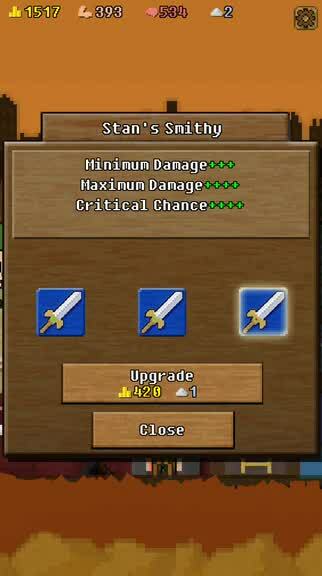 The blue swords will deal physical damage, the red staves dish out magic attacks, and the shields boost your defense. There are also crate tiles that have the chance to give you power-up items to use to your advantage, like fireball spells and food for more energy (so you aren’t falling behind). The keys will open chests, but be warned — they may not always be so plentiful. The purple arm and blue brain increase your power and though, and these are used to recruit captured monsters to your boat for special bonus effects. While other games have you wait until all of the combos are done before you can make another match, YMBAB is all about speed — you can keep moving lines and make matches even as a combo is happening. This means more strategy is involved than your standard match-three RPG, and it is much more rewarding. There’s also a lot of planning involved, as you shouldn’t make matches when there are no chests or enemies on the screen yet, since your attacks won’t take action until they’re in front of you and that means a waste of matches. I’ve been playing YMBAB since last night when it hit the App Store, and since then, I haven’t been able to put it down — I’m just in love with this game. The graphics are fantastic, the chiptune music and sound effects add personality to the game, the controls are simple and easy to pick up, and the gameplay itself is insanely fun, challenging, and addictive. 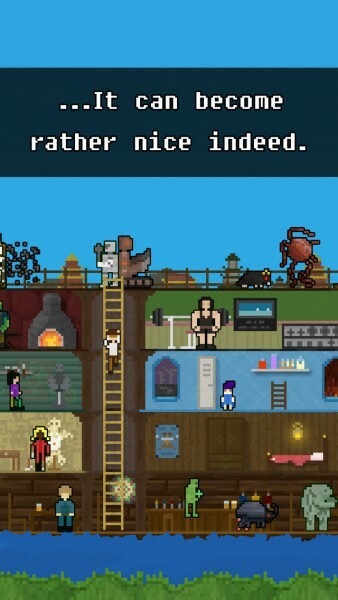 Seriously, this is a must-have game this week. 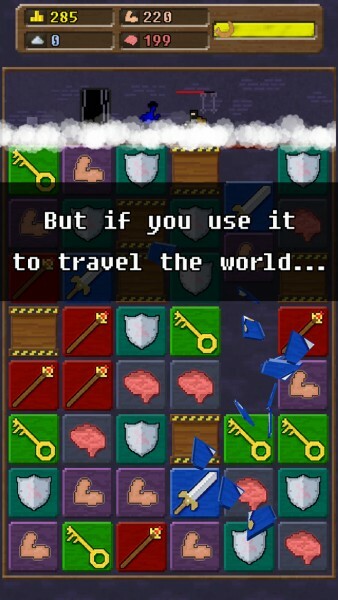 I highly recommend checking out You Must Build A Boat if you’re a fan of match-three puzzle RPG games, or if you loved the first one and have been waiting for the sequel. Now, if you excuse me, I have a boat to complete. 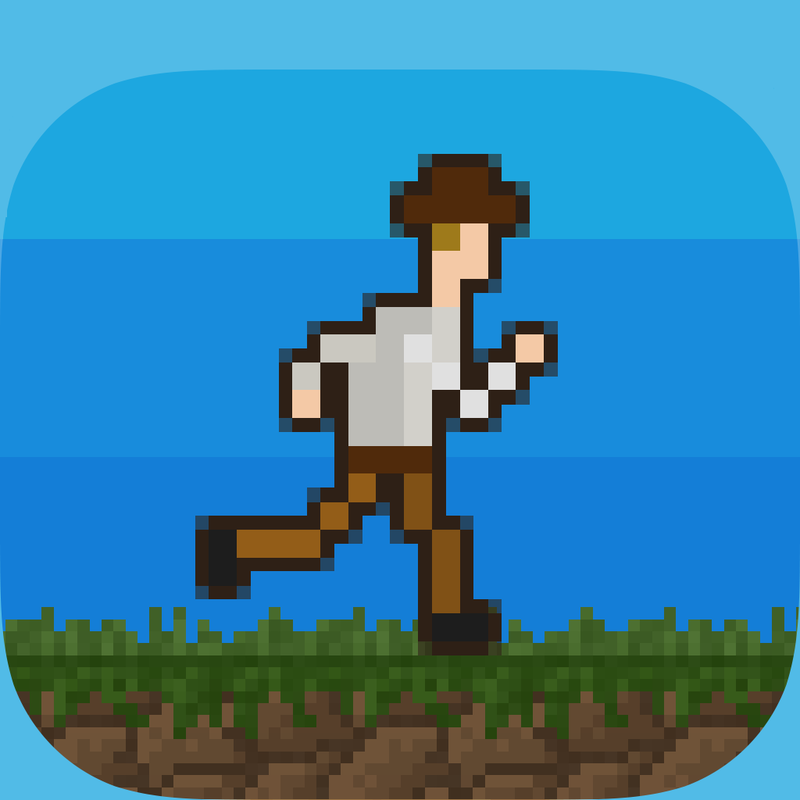 You Must Build A Boat is available on the App Store as a universal download for $2.99.